The January 2018 issue of Afternoon magazine released on Saturday has announced new works that will begin serialization in its March 2018 issue. Masakazu Ishiguro (Soredemo Machi wa Mawatteiru) will pen a new manga under the title Tengoku Daimakyou, and the series is expected to begin its serialization in the March 2018 issue released on January 15, 2018. Shimoku Kio (Genshiken) will release Hashikko Ensemble (working title) starting from the April 2018 issue, to be released on on February 24, 2018. Honda (Gaikotsu Shotenin Honda-san) will publish Tatta Hitotsu no Koto shika Shiranai (working title), which will be a long one-shot in the May 2018 issue to be released on March 24, 2018. Finally, Yuki Urushibara (Mushishi) will start a new series involving with a mysterious case, a boy, a girl, and a cat with special circumstances, which will be announced later, starting in the June 2018 issue slated for April 25, 2018. Afternoon was established in 1986 as a monthly magazine. 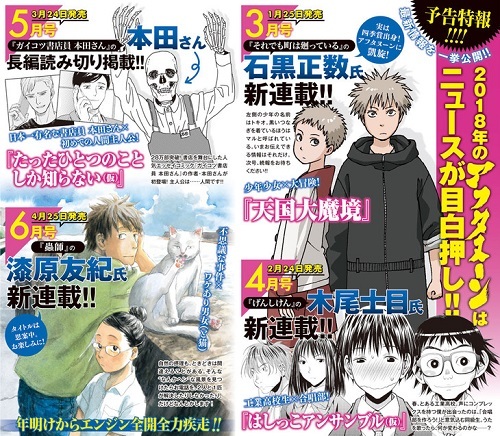 It has publicized manga series that have been adapted into anime, most notably Kiseijuu, Genshiken, Blame!, Mushishi, Sidonia no Kishi, Soredemo Machi wa Mawatteiru, Houseki no Kuni, and Aa! Megami-sama!. yeah first shounen jump this year then Urasawa Naoki and Asano Inio's new work.now shounen sunday and then this. Let's wait and see how many of these new series will actually be good. Disappear. This chair is an eyesore. This chair. This chair. This chair. This chair. This chair. This chair. This chair. This chair. This chair. This chair. This chair. This chair. This chair. This chair. This chair. This chair. This chair. This chair. This chair. This chair.